The taste of Aloo Ka Paratha of mother’s hand has no match. It always remind us the golden days of our child hood. 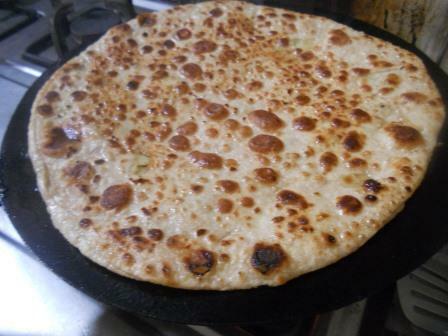 It is delicious, shallow fried, spiced potato stuffed Punjabi Paratha which is the choice of all generations across South Asia.The ingredients used are found in every kitchen so it can be prepared easily at home. It is served in breakfast traditionally, however it can be served in lunch or brunch undisputedly. Rarely it can be tabled in dinners too. The hot paratha with a dollop of white butter (or makhan) melting on top has its own place for taste. 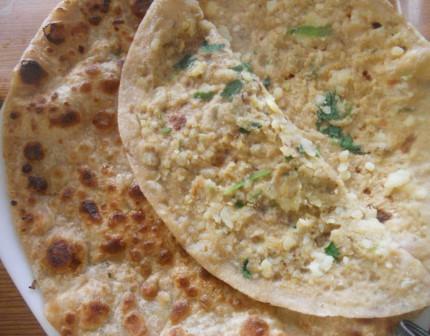 Alu ka paratha is served with plain yogurt, green coriander/mint chutney and tangy pickle of your choice. You may serve it with raita of any sort instead of plain yogurt. Follow the detailed instruction step by step with photos to cook like an expert. Take wheat flour, salt and oil in a bowl. 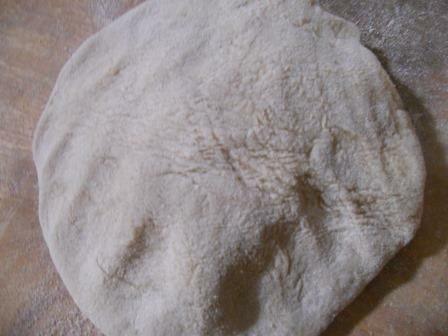 Add water in small quantities incrementally and start kneading to soft and smooth dough (as we do for chapati dough). Grease it with oil, cover it with clean cloth and set aside for 15-20 minutes. 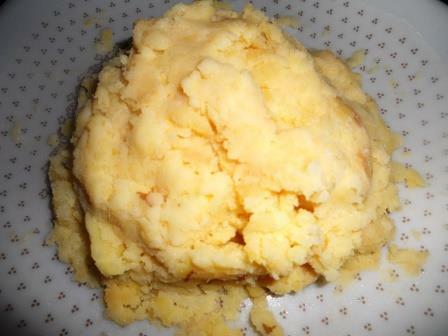 You may prepare dough during boiling of potato. To make it smooth, knead it lightly after 15 minutes. 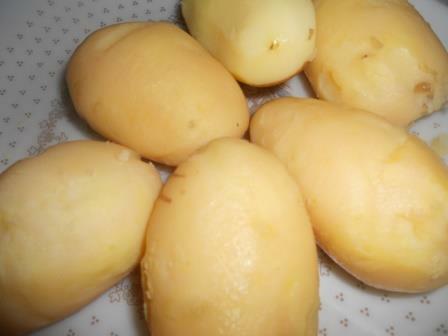 To boil, take the potatoes in a shallow pan and add enough water so that potatoes submerged in it. Boil for almost 15 minutes to soften. Remove the potatoes from hot water and let it cool down. Then peel the potatoes. With the help of a masher, mash them will until no chunks remain, Paratha may get break, otherwise. 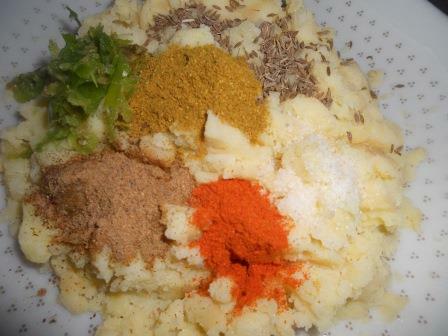 Add Red Chile Powder, Green Chile, Black Pepper Powder, Salt, Cumin Powder, Dry Coriander Powder, Chopped Onion, Chopped Green Coriander, Spices Powder, anar-dana and mix them properly. Using your palm, make 2 smooth balls and then flatten it. With the help of rolling pin and board, roll it into 3-4 inches diameter circle. Place a lump of potato stuffing on it and spread gently. Place another flatten piece on it and roll it very very gently. Remember, making perfect paratha needs practice. Roll into circular shape of 6-7 inches diameter. Do not make it very thin by pressing it too hard. Heat the tawa/griddle on medium heat. Place the rolled paratha gently on it. Cook it for some seconds till you see tiny bubbles starts to rise on the surface. Flip it and reduce flame to low. Cook other side as well and apply some oil on the surface. Flip it and spread oil arround its edges. Cook it and press it with spatula and cook 30-40 seconds over medium flame. Repeat the process until golden brown. No need to spread oil again. Transfer it to a plate, place a lump of butter on it and serve hot. Follow the same process for rest of the parathas. 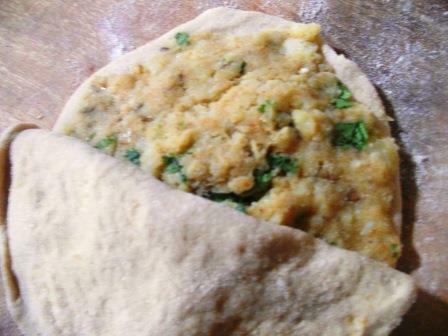 Give stuffing some time to cool down before filling in paratha. For softer outer layer you may use milk instead of water. Use mint leaves or ginger-garlic paste as taste enhancer in stuffing. Wrap it in aluminium foil and give it to your kids, adults for lunch.